My Life in Mexico Costs a Fraction of What it Would in U.S.
Betsy Anne Edmonds has lived full-time in Mexico for nearly 15 years and wouldn’t have it any other way. She chose the town of Ajijic—part of the largest expat community in Mexico with many services, including a vast English language library, and excellent Spanish lessons—and moved into a two-bedroom apartment for $550 a month. “It was easy to become involved in the community and make lots of friends, both with fellow expats and the locals,” says Betsy Anne. With a passion for animals she moved to Mexico with her two cats, but it didn’t take her long to add to her menagerie by adopting rescue dog Marx. And then she met Ed…. “Eleven years ago I met a fellow expat [Ed] and fell in love,” says Betsy Anne. He was renting the casita of a large 3,000-square-meter house. When the entire property became available, they decided to rent it for $1,000 a month and moved in together. Eventually they bought a property together in Ajijic—a two-bedroom house with a separate casita that included a bedroom and bathroom, garage, and ample outdoor living space. It cost them $150,000, with a further $150,000 of renovations spent gutting the house; redoing everything from the electricity to the sewers, and completing it with high-end finishes. While Betsy Anne loves Ajijic and the people there, for the past four years she has spent most of the winter in Puerto Vallarta on the Pacific Coast, where she prefers the climate—lows in the 60s F and highs in the low to mid-80s F.
The expat community in Puerto Vallarta has also grown tremendously in the last 10 years, resulting in many more services, volunteer opportunities, and social events. So, Betsy Anne and Ed have agreed to sell their home in Ajijic. Ed is moving back to the U.S. for health and family reasons, but Betsy Anne is on the hunt for a new condo in Puerto Vallarta. With a budget of around $250,000 she’ll get a high-end condo with great amenities. Betsy Anne’s quality of life in Mexico comes at a fraction of the cost it would anywhere in the U.S.—especially in New York City. 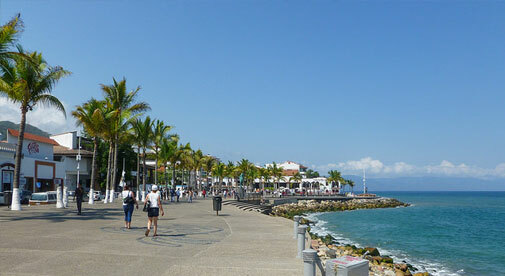 Low cost of living, perfect weather, and endless activities make Puerto Vallarta an ideal place to live full-time.